There are many reasons for non-participation during meetings including lack of preparation, shyness, being overawed by rank or someone's specialist knowledge, being put off by another's aggressiveness or dominant behaviour or just pure laziness. It is equally important to remain focused on the agenda and what needs to be achieved. 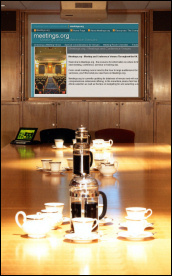 To do this you will want to summarise progress and remind everyone of the meeting's objectives. You will also have to interrupt if the discussion gets out of hand, off topic, too heated or rowdy. Act quickly if a serious disagreement arrises. Sometimes a participant may have something worthy to contribute but may not be the best public speaker. At such times it is the chair's job to rescue that person by helpfully summating what they think he/she was trying to say.